Though I'd post this after my experience. 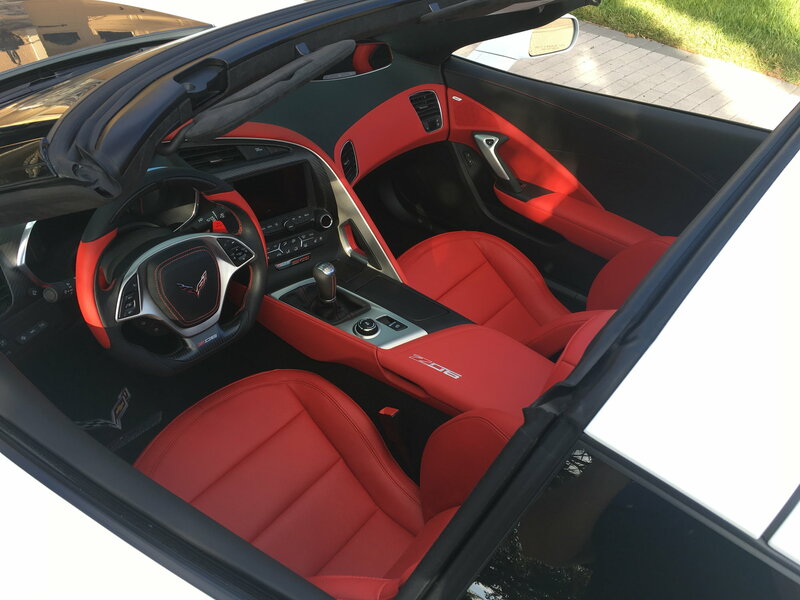 First, I just sold a 2016 Z06 3LZ with the GT seats. I've always loved the look of the Competition seats and once we established that the cushioning is roughly the same, I saw no penalty. But based solely on posts/threads here, I convinced myself that they wouldn't work for me due to fit. I found the GT seats a little snug even in the most "open" setting and others have stated that if the GT seats are "snug" don't even think about the Competition version. I've never been able to find a dealer around here (Greensboro/WS, NC) that had the option so I could test and confirm for myself. Well I took a leap of faith and bought a 2019 Z06 that had them and figured if I absolutely can't fit, well I could just sell them. Car arrived yesterday and with some apprehension I descended into the seats. They fit like a glove! I absolutely love these, 1,000% better than the GT's. I road race, so I'll get the use out of them for sure, but the best part is no penalty. So here's a few sizing comparisons that I hope help. I'm not a small guy. Figure 6', 235lbs and pretty athletic build (think wide shoulders). Not all 6 footers are the same, so I need to tell you that I wear a 32" inseam. (I know TMI) The part that was a concern, and that is hard to determine from pix and other's post, is where is the side bolster going to hit your back. I played football in HS and really built up my lats to the point where almost nothing fits me properly off the rack. I wear a 48R jacket, which means I have a 48" chest. The bolsters actually hit me just below the lats and hold me perfectly. Thankfully, as the alternative would be to pull the seats and sell them. I hope that this helps some one else thinking of buying/ordering a Z with the competition seats - that like me, couldn't find a set in my area to test. Last edited by mdolandese; 01-27-2019 at 10:06 PM. I don't think there's any difference in comfort especially in the seat bottom. I should've also shared, I think I'm about the largest you can be and fit properly. In other words, if a size 50 jacket is snug in the lat area you're probably not going to fit. Again, hope this helps someone. Having been on several long road trips in the comp seats, no issues with comfort. Last edited by mdolandese; 01-27-2019 at 06:17 PM. I'm going from memory but I tend to agree with you. I recall them being a bit more firm & not as soft but perfectly comfortable, at least for me. That was one of the reasons I borrowed my friend's Z06 1.5 years ago for a 1,200+ mile road trip because I wanted to see if I would like the seats during extended driving periods. I sat in the comp seat for 9+ hours straight on the first day, only stopping twice for gas along the way, without issues. They're the one thing missing from my car that I wish it had. 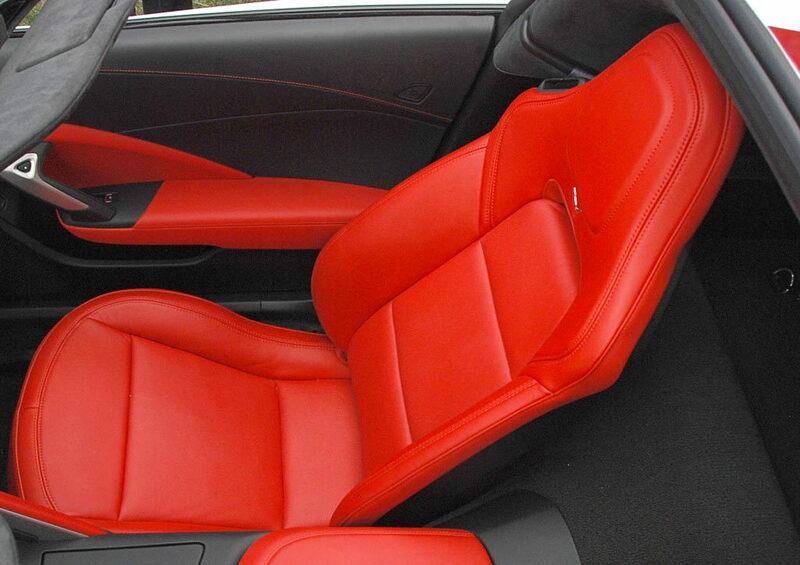 The comp seats were on my wish list for my C7 and admittedly, for the cool factor. Now that I have my Z with the comp seats, I find them really comfortable and the wife loves them as well. Looking forward to my first track day to try them out functionally. Glad they work for you. I sat in them today at an auto show. Would work great for me. However the wife found them uncomfortable. I was considering doing the modification to mine but it won’t work. She already finds the car a PAI to get in and out. We would just end up enjoying it less. They do look bad *** but I’ll get over it. I luv my comp seats. I admit I was attracted to the cool factor and how nicely they match up to my carbon fiber dash & trim, but after driving both short and longer drives, I find them very comfortable and they fit like a glove. Last edited by MSG C5; 01-27-2019 at 10:43 PM. When I began the ordering process on my 2015, I toiled over whether to add that 2k option to my 3LZ. I loved the appearance, and decided to add that to the other options. With over 46K miles in the seat I'm glad my penny pinching didn't get in the way. So glad I took that option as they are very comfortable, and really hold me in the seat as well (bad back and all). If I decide to up grade to a newer C7/C8, I'll definitely check the box again. Last edited by Kingspoke; 01-28-2019 at 01:38 AM. Comp seats indeed come with stiffer foam. It's not a big deal at the back, but it does end up increasing the minimum sitting height, which is a problem when you wear a helmet. I have the competition seats in my '19, but unfortunately haven't had the opportunity to drive it since it was delivered to our house. 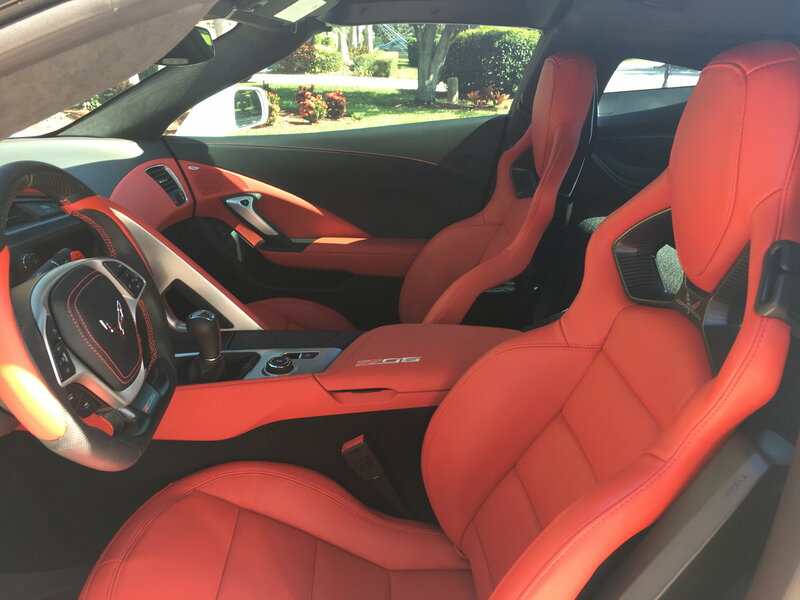 I had the GT seats in my '16 and thought they were comfortable. I wanted something different in my new one. The competition seats are definitely a little tighter, which I like. I'll enter this data point regarding comp seats. I have leather bottom comp seats and they are firm, but comfortable but I feel like I sit up pretty high even with the seat all the way down. In the comp seats with suede bottom cushion, I sink in farther and the cushion itself does not feel as firm. I definitely sit a little lower in the car with the suede bottom comp seat. 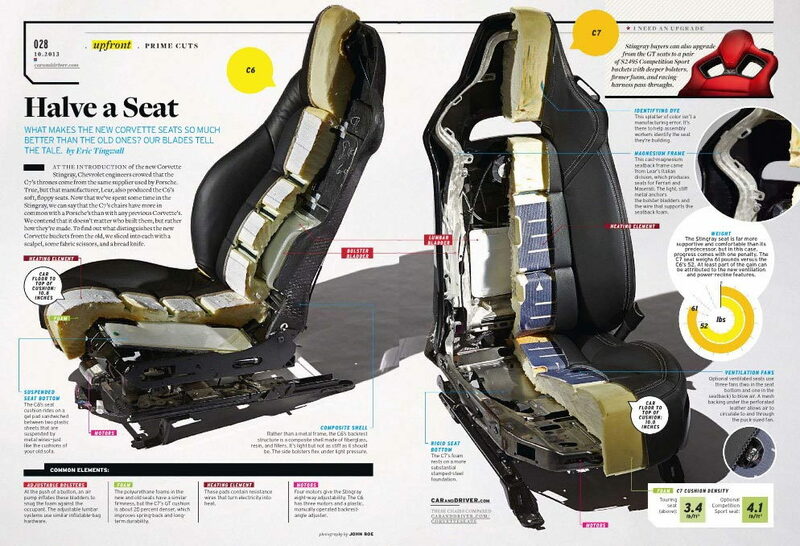 I tested this in two different cars with the suede bottom cushion comp seats and found the same thing. don't the gt and comp seats have the EXACT same bottom, just the top that's different? I too compared before I bought. Had my heart set on the comp seats, but looking at and sitting in both back to back, i could tell 0 difference between the two seat types on the bottom, and honestly the top only LOOKED different to me, so I decided it wasn't worth an extra 2 grand for the cool factor. Also I think the GT seats look a little more exotic luxury (e.g. Porsche) and the comp seats look a little more racy, so I figured why waste the money. The Comp Seat bottoms are different both in padding and appearance as they have more panels than the GT seats. Last edited by MSG C5; 01-28-2019 at 11:31 AM. Love the comp seats. Comfortable for me personally and liked the look better. I have the comp seats and love them. I also have a 48 inch chest as the op, but if you carry a "little extra" weight around your midsection as I do at times, the side bolsters can be a bit confining on a long trip even when they are relaxed as much as possible. Sorta like when you pants are a smidgen too tight or a suit jacket that is one size too small. Very happy with my comp seats for normal use but would love extra room needed for helmet clearance. Why would the Comp Seats be designed to give the driver less headroom when "Comp" use involves wearing a helmet? I have to use a transparent roof at the track and a dot helmet instead of a snell because of this issue. Maybe the c8 will have more room for us tall torso guys. Just got back from my first track day with the z06 with comp seats. At 6' (with a little longer torso), I was about 1.5 inches too tall for the hard top Z with my helmet on. It was uncomfortable as hell. The seats felt great to use on the track, firmly held me at up to 1.47 Gs lateral, but the helmet was jamming my neck down into my shoulder blades and I was hunched over something awful. If you plan to track, put on a helmet in the dealership and check it out.